After nearly 5 years with Blogger, I finally made the switch to WordPress. While this move might look sudden, it was actually some time in the making. About 2 years ago I began looking into using WordPress but I found it rather complicated to use. Blogger is much simpler and easier to use, and is a good choice for beginning bloggers. Over the course of these 5 years, I opened not 2 but 4 blogs on Blogger. 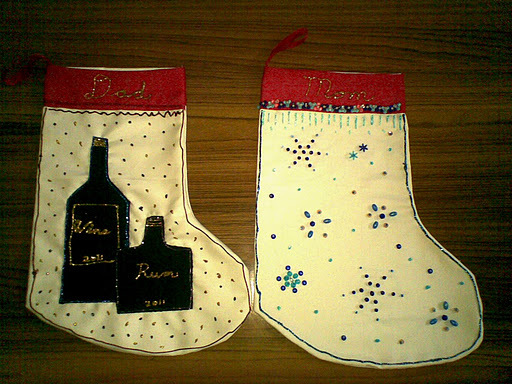 One never went anywhere as my idea for it was super limited, and the other I kept private. Well, it was read by the public but I was anonymous on it as there were things I wanted to write about without anyone knowing who I was. It served its purpose and after a few months I no longer felt the need for it. Next I began to feel the strain of keeping new content on 3 blogs. While I enjoyed having one that focused on motherhood, I often was stuck knowing what to write about next, and then time would drag on with no new posts going up and I’d feel bad about it. Then I’d try to focus on it and my personal blog would get ignored. I think it was some time last week when I began to think seriously about having a website instead of 3 blogs. I wanted to put all my content in one place and organize it so that it could be found easily, but it was something I’d need help with. I also wanted to start with something free instead of buying a site, so after some reasearch I decided to use WordPress. I like that I still have the option of owning the address in the future, and I may just buy it at some not-to-distant point. You do get more options and are freer to customise a personal site, but for now, the free version is right for me. Now I have the huge job of going through all my old posts (over 500 of them from 3 blogs). I have to deleate unnecessary ones, redo links, edit parts that don’t apply, and so on. As you can see, I have separate pages for the topics I want to make most available. These will have a snipit of the post and a link to it. I wanted to have a separate blogroll for each but that isn’t allowed. So everything I write will go on the blog, then anything that pertains to one of those topics will be linked there as well to make it easy to find. It’s going to take time to get it all in order. I’ve already spent the past 2 days working on it in every spare moment, but once the job is done I’ll be happy. That got me going and I started thinking about what kind of prep I needed to do. 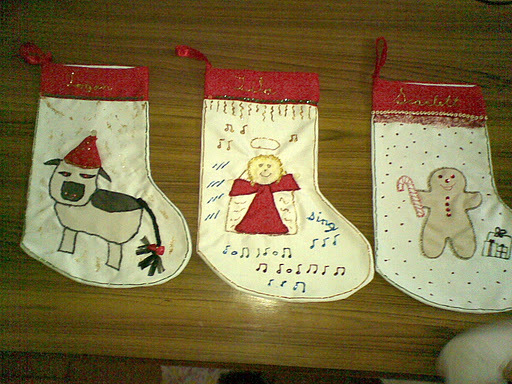 For some time now I wanted to get us all some nice Christmas stockings but first of all, they are hard to find, and second, when you do find some, they aren’t worth the price as far as the quality goes. So I got inspired to make my own. The day the idea came I put it to work. 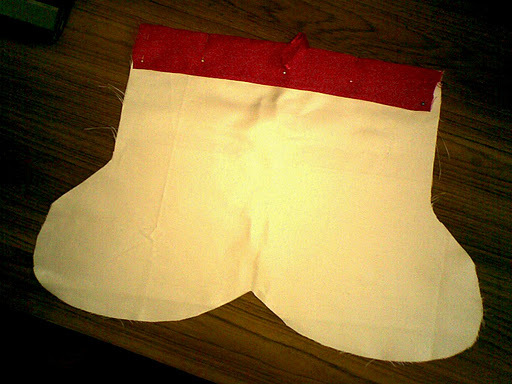 I dug out a thick white bedcover that I knew I would never use on the kids beds to use for the main stocking part, some red cloth for trim, and newspaper for the pattern. 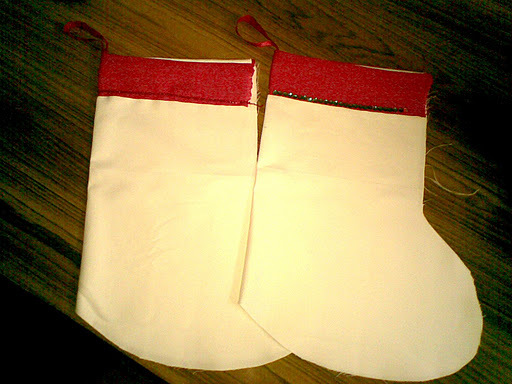 Within minutes I had 5 stockings cut out and 5 red trims. That was the quick part. I don’t have a sewing machine so I am doing all of the stiching by hand. As you can see, I cut them on the fold to save myself some stitching. 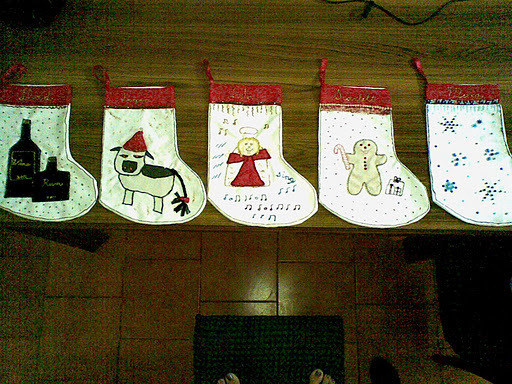 At this time, two stockings are in this state. Two others have the trim completed. The red beads were on a string so I just overstitched them on, but the sequins and beads I had to do one at a time. It was both tedious and fun. And here is the first one I completed. 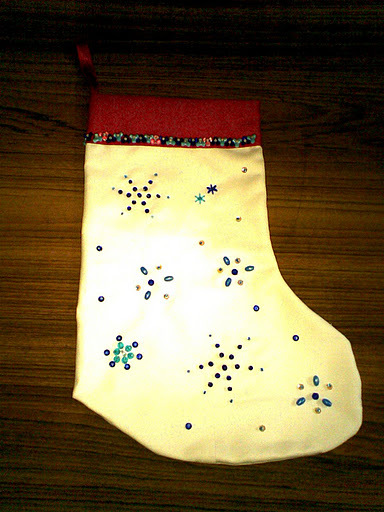 I love beadwork so I am using that for most of the decorations, but I am also going to try some applique. 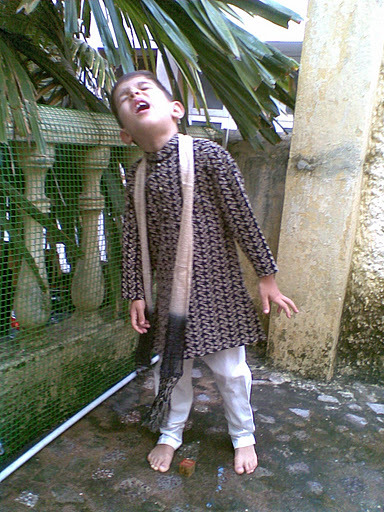 The kids want certain pictures on theirs and it will take some effort on my part but I hope they will come out ok. 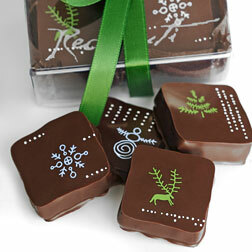 This one with the snowflakes is mine. Other Christmas prep that I have in mind is to try an experiment with fruitcake cooked on the stove, rum balls, maybe some Nanaimo bars, and peppermint vodka, using the pieces of candy canes I saved from what mom sent us last year. Check out the link for this great idea. 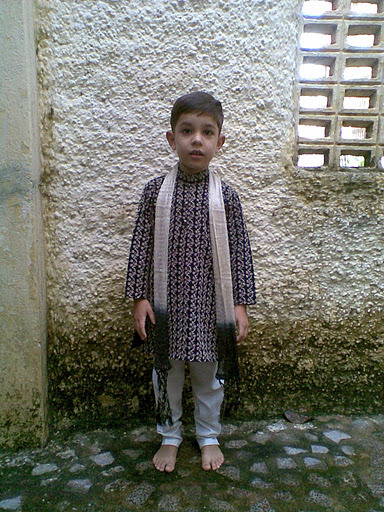 On Monday Logan had Diwali celebrations at school, so he got a chance to wear his kurta again. It is only the second time he has worn it and it is already tight. But at least he has gotten some use out of it. When Logan was about 5 months old, I decided I didn’t want to forget the progress he was making, so I started a baby book for him. I was keeping monthly records on the computer, plus I had printed a book to fill out. And once Lila came, I did the same for her. I wasn’t too happy with the books though, because I could only record what was in the book and there was stuff I wanted to add that I didn’t have space for. Plus I had to print the book itself, print the photos, cut and glue stuff…I didn’t have time for all that. To top it off my handwriting is not the neatest so the book looked messy. So when Scarlett was on the way, I was dreading the book-making process and what it would cost to do it, especially with color printing being so expensive. 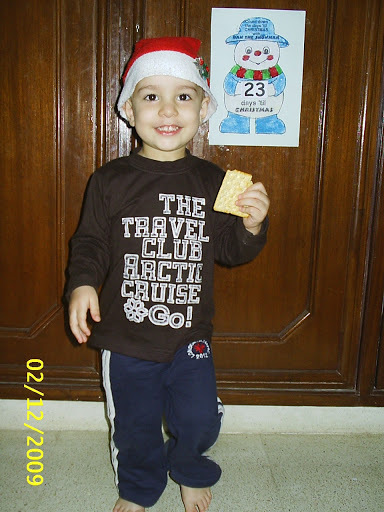 That was when I thought, “There must be a way to do this digitally.” So I looked it up and found a scrapbooking site that provided a simple, user-friendly program for making your own scrapbooks. This was just what I needed. I tried a few of those sites where you keep the book on line, but that wasn’t practical for me. Sometimes the internet isn’t reliable and I didn’t want to be working on something and not be able to save it if, for example, the power went off or the computer froze. So this program was the simple solution. In my research I found that digital scrapbooking is very popular, and you can find loads of backgrounds and embelishments to add to the very basic ones this program offers. It’s fun working on them, and the best part is that every page can look neat and be arranged the way I want it. I’ve been uploading them to Facebook since it is easier to load large amounts of pictures there than here, so I’m going to give you the links so you can see them. This link is for Lila’s book. Most of hers is complete. I just need to finish a few of the pages on the end. And here is the link for Scarlett’s book. I will add more to it over time so check back every so often. I’ve not yet started on Logan’s digital book. All his info is in the previous one, but I will work on transfering it soon. My kids love looking at the baby books, especially the one that is theirs. Eventually I will print these out, to be put in a binder, along with any other mementos I have, such as Lila’s first earrings, hair from Logan’s first haircut, and so on. If you are interested in making your own books, I found the software here. 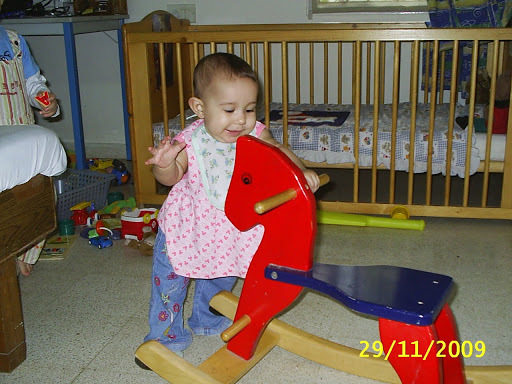 Here is Lila standing up and holding the rocking horse. What do you think of her jeans? Adorable, aren’t they? Today Logan and I did a Christmas art project, a Christmas countdown poster. I printed it out, cut and pasted the snowman to card stock; covered sections at a time with glue and colored sand, and then added the numbers for the countdown. Of course, Logan is too young for projects such as this so I did most of the work, but it was fun. I had to move it higher up on the door as he kept taking the numbers off. He doesn’t yet understand what it is for. I plan to begin baking this week. I’ll let you know how it goes.